SAP is the maker of one of the world’s most popular inter-enterprise software suites. It provides collaborative business solutions for all types of industries. The company’s flagship offering is the SAP Business Suite, which includes solutions for enterprise resource planning (ERP), customer relationship management (CRM), product lifecycle management (PLM), supplier relationship management (SRM), and supply chain management (SCM). 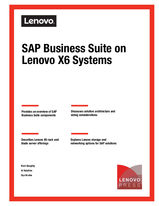 This Lenovo® Press publication describes the solution architecture of running SAP on Lenovo X6 systems, including x3850 X6 and x3950 X6 rack servers and Flex System™ x280/x480/x880 X6 compute nodes. It introduces the offerings and explains the processes that are involved in correctly sizing an SAP platform. The paper also describes tools and resources that are available to help you make the best decisions, and reviews the hardware offerings from Lenovo storage and networking. This paper is intended for SAP administrators and technical solution architects. It is also for Lenovo Business Partners and Lenovo employees who want to know more about SAP offerings and available Lenovo solutions for SAP customers.